← Happy Holidays! Parties, Engagements, Food & Drinks and Gifts…Oh My! Colin Cowie is one of the most admired and respected people in the event and wedding industry. This is from his newsletter on 12/12/13. As the end of 2013 rapidly approaches, 2014 promises to be a year of bright and innovative ideas in the wedding industry, starting with event lighting. More than just a flick of the switch, wedding lighting has become an art that can transform an entire venue from drab to sultry and romantic or energetic. Ira Levy of Levy Lighting LLC honors projection mapping as the top wedding lighting trend for 2014. “Full scale imagery through projection mapping creates imaginative backgrounds that allow you to transport guests to different places.” In addition to Levy, numerous experts in the industry have given insight, allowing my team to gather the top trends for the upcoming year. From new techniques to retro bulbs, the possibilities are endless. One thing I can assure you: carefully planned, innovative lighting for your wedding day is integral to wedding décor success. I agree completely with Colin! 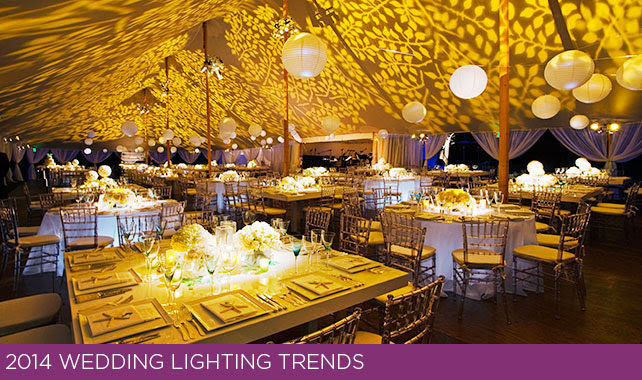 Lighting is a major trend in all events, especially weddings. And it can drastically change the look and feel of an event or venue and transform it into exactly what you have imagined. There are many great lighting companies out there who, in partnership with your event/wedding planner, can help you select the best lighting for your event to make it Exceptional! I found your blog quite interesting and the concern in the blog is really impressive. Thanks for sharing.